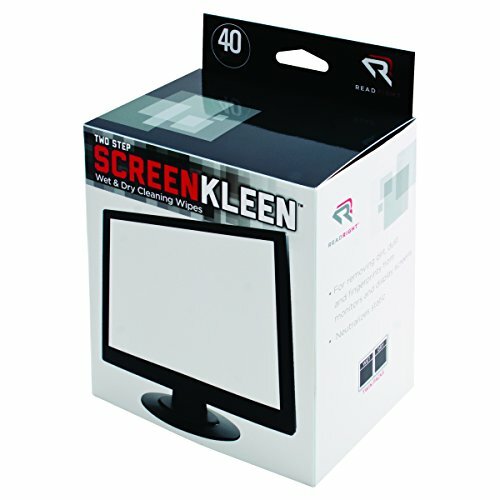 The ultimate in screen cleaning power, Read Right Kleen & Dry is the ideal choice for large or heavily soiled computer and display screens, TVs and much more. The system contains two parts: a heavily saturated wet wipe to neutralize static and effectively remove dust, dirt and oil; and a strong, dry, absorbent cloth for drying and polishing the screen to streak-free optical clarity. Not for use on nylon mesh/polarized antiglare screens. Read Right Kleen & Dry is an excellent choice for small or large office use. Advantus Corp. is dedicated to providing innovative quality products at fair prices. Record Cleaning Solution with Anti-static Vinyl Cloth - Premium LP Cleaner Fluid 6.7oz by Record Happy. Essential 200ml Spray Bottle to keep your Prized Album Collection like New! Record Cleaning Brush Kit - Ultimate LP Vinyl Maintenance Set by Record-Happy: Velvet Brush, Anti-Static Solution Fluid Spray and Microfiber Cleaning Cloth - to Keep your Album Collection like New !